As I mentioned in my previous weekly post, we were running out of ideas for places to take pictures. So it's a good thing Liam made his appearance this week! 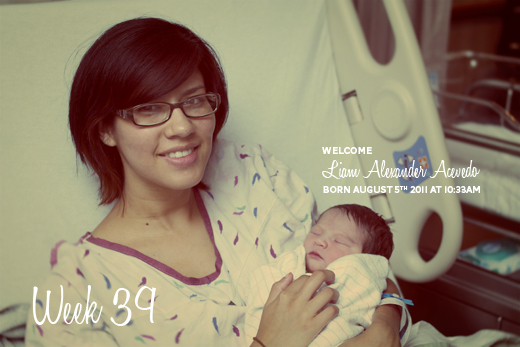 He was born on Friday, August 5th at 10:33am. He weighed 7 pounds 10 ounces. 20 inches long. So without further ado, here's the Week 39 photo...the final photo in the Belly Series. I'll be back to write a proper birth story post. In the mean time, feel free to come visit us at Rose Medical Center to meet our little man. He'd love to say hey.